CBD is one of at least 113 cannabinoids identified in the hemp family. It is a major phytocannabinoid, accounting for up to 40% of the plant’s extract. CBD does not have intoxicating effects like those caused by tetrahydrocannabinol (THC), and may have a regulating effect on imbalanced thinking, anxiety and sleep. What’s the Difference between CBD & THC? CBD and THC are the two most abundant of the many cannabinoids found in the hemp plant family. They both interact with the endocannabinoid system but elicit different natural effects. Their chemical makeups are similar to the body’s own endocannabinoids, which allows them to interact with the endocannabinoid system’s cannabinoid receptors to alter the release of neurotransmitters in the brain. Despite their similarities, CBD and THC have distinct differences that influence how they interact with the endocannabinoid system and subsequently the natural effects they elicit. The Endocannabinoid System is the name for a series of cell receptors in the body that respond to certain kinds of agonists. Two primary cell receptors make up the ECS, Cannabinoid Receptor 1 (CB1) and Cannabinoid Receptor 2 (CB2). The keys for these receptors are called endocannabinoids. Endocannabinoids got their name from cannabis. Plant cannabinoids were discovered first in the plant and then in the body. Endo means within, and cannabinoid referring to a compound that fits into cannabinoid receptors. There are two main endocannabinoid molecules, named anandamide and 2-Ag. Funny thing, scientists would not have discovered anandamide without THC. Psychoactive (THC) was first discovered by Israeli scientist Raphael Mechoulam back in the 1960s. His finding quickly spurred a rush to figure out how THC worked, and whether or not our own bodies produced a similar compound. One of the key differences between CBD and THC is whether the cannabinoid will cause a euphoric effect, or “high,” when consumed. THC is the cannabinoid people think of when they think of marijuana. It is a direct agonist of the endocannabinoid system’s cannabinoid 1 receptors (CB1), found primarily in the brain and the central nervous system. The psychoactive effect that most associate with recreational or medical marijuana use is exclusively brought about by activating CB1 receptors. CBD doesn’t bind with CB1 receptors and is actually is considered an antagonist of CB1 agonists. This not only means that CBD can never cause a high, no matter how much is consumed, but that it also acts to suppress the CB1-activating qualities of compounds like THC. CBD and THC are both found throughout the seeds, stalks, and flowers of both hemp and marijuana. The two exist in cannabis plants in a wide range of proportions. However, while THC is most plentiful in marijuana, CBD is present in higher quantities in hemp. In marijuana, THC dominates the plant’s chemical makeup. Marijuana is generally cultivated specifically to maximize its THC content. Over many decades, marijuana has been manipulated and cloned with particular emphasis on increasing its THC concentration and producing more powerful intoxicating effects. While THC content can be as low as 3 percent in marijuana, on average, marijuana strains today contain approximately 12 percent THC. Hemp’s chemical makeup, on the other hand, is dominated by CBD. By definition, hemp’s THC content is no more than 0.3 percent, nearly 10 times less than the least potent strain of marijuana. Instead, hemp naturally has more CBD vs. THC, making it an ideal source of CBD from cannabis. CBD and THC are considered structural isomers, which means they share the same chemical composition but their atomic arrangements differ. The two compounds share a molecular formula of C21H30O2 and molecular weights of 314.4 g/mol. The atomic arrangements of the two cannabinoids differ slightly. Both CBD and THC are considered cyclic compounds, which means one or more series of atoms in the compounds are connected to form a ring. CBD comes with an open ring with a hydroxyl and alkene group, while THC supports a closed ring with an ester group. It’s these slight differences in how their atoms are arranged that have the dramatic effect on how the two cannabinoids interact with the endocannabinoid system’s receptors. CBD and THC both interact with the body’s endocannabinoid system and its specialized cannabinoid receptors, CB1 and CB2. It is through these interactions that these two cannabinoids augment the endocannabinoid system and encourage balance. However, the ways in which the two cannabinoids interact with these cannabinoid receptors vary. THC directly binds with both CB1 and CB2 receptors, while having a higher affinity for CB1 receptors. CBD has little affinity for the two cannabinoid receptors. Instead, it acts as an indirect antagonist of cannabinoid agonists. This means that CBD acts to suppress the CB1 and CB2 activating qualities of a cannabinoid like THC. CBD has also been found to interact with other non-cannabinoid receptors, including 5-HT1A receptors and the vanilloid receptor TRPV-1. We’ve previously detailed the research findings on the effects of these cannabinoids interacting with the endocannabinoid system. You can learn more about the findings about CBD or THC. The legality of cannabinoid products in the United States is dependent on their concentration and source. Marijuana and THC are both specifically listed in the U.S. Controlled Substances Act and therefore prohibited under federal law. Twenty-nine U.S. states and Washington D.C. have passed their own cannabis policies permitting the use of medical marijuana with high levels of THC, provided it’s recommended by a licensed physician. Eight of those states and Washington D.C. have gone a step further and legalized the recreational use of marijuana and THC. CBD is legally available in the United States, but it must be derived from imported high-CBD, low-THC hemp. CBD itself it not listed under the Controlled Substances Act, so it’s legal in all 50 states provided it’s not extracted from marijuana. 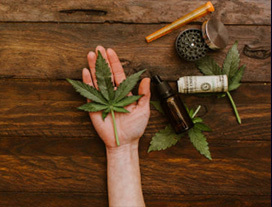 If derived from marijuana, CBD is illegal unless obtained through a state-regulated medical marijuana program or in a state that permits recreational marijuana use. CBD products derived from hemp are considered dietary supplements in the U.S. and legal to buy and sell. While there is a risk of some negative side effects from THC, according to the National Cancer Institute it is not possible to have a fatal overdose. Some studies have found evidence that cannabis strains high in THC can cause long-term negative psychiatric effects when consumed by adolescents, including increasing the risk of psychiatric disorders like schizophrenia. Research indicates even large doses of CBD are well tolerated and safe. There have been some reports of dry mouth, light-headedness, and drowsiness. A recent research review examining the safety and side effects of CBD concluded that CBD appeared to be safe in humans and animals. Even chronic use of CBD by humans showed to cause no adverse neurological, psychiatric, or clinical effects..